A dry, crisp Loire Valley white wine from near the Atlantic. Organically farmed Melon de Bourgogne grapes from the Petit Mouton sub-region. 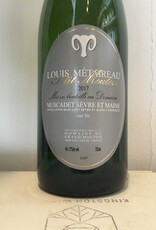 As Muscadet wines require, this wine is 'sur lie' meaning it rests on its lees for an extended period, adding texture. An ideal seafood wine, great with shellfish or white fishes. Louis Métaireau — along with his band of vignerons d’art, as his like-minded group of producers were known — was instrumental in restoring the reputation of the Muscadet appellation in the middle of the 20th century. It was he who first began leaving his wines sur lie (on their fine lees) through the winter.Since taking over for her father, Marie-Luce Métaireau and her husband, Jean-François Guilbaud, have illustrated their deep love of the land by reclaiming the vineyards of the vignerons d’art and piecing them back together to compose one of the most prized sites in all of Muscadet: the Grand Mouton vineyard. The 23-acre vineyard in the heart of Muscadet Sèvre et Maine enjoys perfect exposure between the two famed rivers that lend their names to the AOC, and ranges in vine age from 30 years old to a parcel planted in 1937. The vines are tended organically, and everything is harvested by hand — a rarity in this region, where 98% of all grapes are machine-harvested, and conventional farming with chemicals is the norm. Marie-Luce’s charming, bright personality is reflected in the wines she produces. Petit Mouton, from the “young” vines (35 years old), is very mineral and precise. Black Label, from slightly older vines, is the most classic example of the terroir in the lineup, with more depth. Grand Mouton is harvested later than the Black Label and has richness to pair with the minerality. Cuvée One, from the parcel planted in 1937, shows amazing depth and complexity, and is capable of long aging.